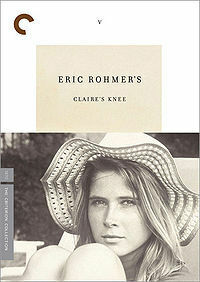 Claire's Knee (French: Le genou de Claire) is a 1970 film by Éric Rohmer. It is the fifth movie in the series of the Six Moral Tales. On the eve of his wedding, on holiday on the Lake Annecy shore, a career diplomat visits an old acquaintance, perhaps a former girlfriend. Through her he meets an intense teenager, Laura, and then lusts after her sister, Claire. Whilst Laura attempts to flirt with him, his fantasy becomes focussed on wanting to caress Claire's knee.